The beautiful, natural finish and the full grain leather upholstery combine perfectly to create a gorgeous, handcrafted, Western style bed. 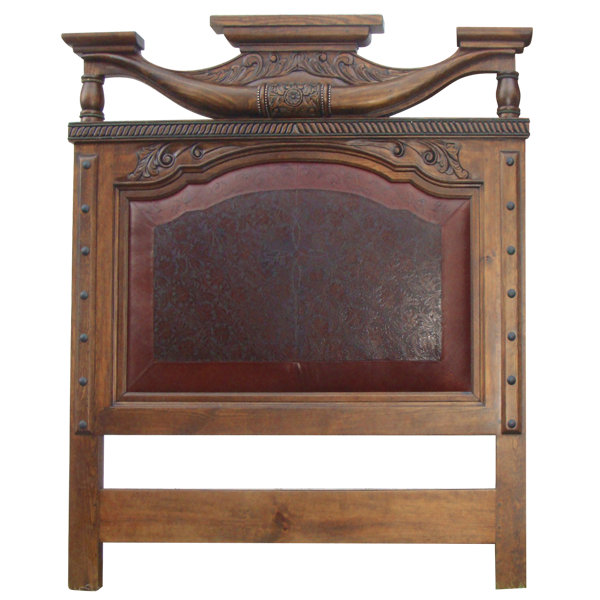 The headboard has a rectangular, solid wood frame, with an elegant, centered, top, crown molding. Directly below the center molding are lovely, hand carved, floral and scroll designs, followed by remarkable, hand carved horns and a hand carved, twist rope design. The center of the horns are accented by hand tooled leather, secured by gilt nails. 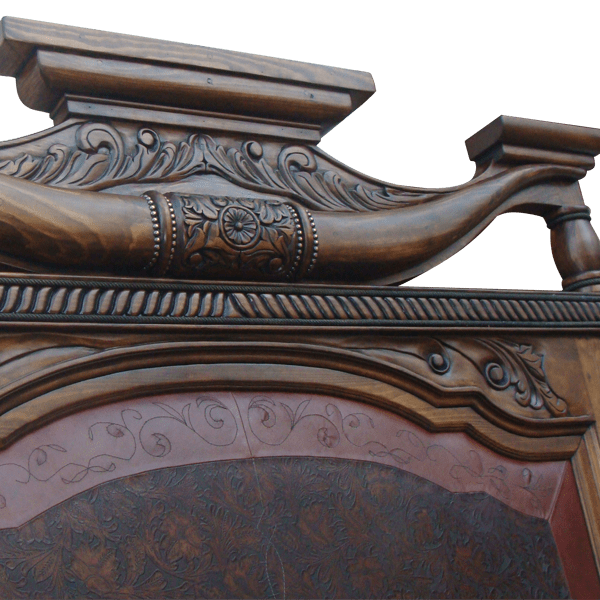 The front of the headboard has a large, padded panel with a curved top, and the panel is covered with dark, brown, patterned, full grain leather, with contrasting, earth color, full grain leather on each border. The upholstery is double stitched together for extra strength and durability. Hand forged, iron nails are intermittently hand tacked to all sides adjoining the leather panel. The headboard is framed by solid wood uprights, and hand tacked to the face of each upright are hand forged, iron nails. Above the top of each upright is a small, square, crown molding. It has a classic finish, and the headboard rest on square cut legs. It is made with the best, sustainable, solid wood available, and it is 100% customizable.